Kansas State University in 1940. She married the love of her life, David Wayne Axton on June 1, 1941. At age 11, Micky took her first airplane ride with one of the famous Inman Brothers of Inman Flying Circus Fame. She was "hooked". She learned to fly at Coffeyville Junior College in the Civil Pilot Training Program in 1940. Her first passenger after receiving her license, was her 91 year old grandmother. In 1940-41, she was invited to teach in Coffeyville Junior College science department. After America entered World War II, her big brother became a fighter pilot and served at Guadalcanal. Micky wanted to do her part to help the war effort. When her country needed her in 1943, Micky made an enormous sacrifice. She said goodbye to her husband and one-year old daughter and joined the WASP program in class of 43-7. After completing the Army Air Force flight training and earning her WASP wings, she was stationed at Pecos Army Air Base, Pecos, Texas. She flew the BT-13, AT-6, and UC-78's, as a test pilot. Micky's mother took care of their young daughter. After deactivation, she was employed by Boeing Airplane Company in engineering flight test as a flight test crew member. From 1958 to 1960 she taught biology, general science, aeronautics and debate at Wichita, Kansas, East High School. In 1968, she joined the Confederate Air Force and began her mission to inspire others with her WASP story. In 1988, she was featured in CAF Dispatch magazine. In 1990, she was featured in Corpus Christi Caller Times and invited to be guest speaker for graduation of Navy pilots. In 1991, she was speaker with Capt. Cathy Sadler USAF for the "grand opening" of the Kansas Aviation Museum. She flew the only remaining airborne B-29, flying "Fi-Fi" to a Wichita Kansas airshow and a Boeing Aircraft open house. She had a TV interview with General Paul Tibbets of Enola Gay (B-29). In 1992, she was invited to return to Corpus Christi for graduation of Navy and Marine pilots, and was presented with gold Navy pilot wings. She has been featured speaker and honored guest for many organizations, including Boeing, Air Force Association, CAF, Daedalians, DAR, Minnesota Women's Veterans, NintyNines and so many, many more. Micky has been inducted into the International Forest of Friendship and received numerous awards, including "Distinguished Service Medal" by the International Confederate Air Force, "Aviation Historian of the Year," and "Distingiuished Alumni" by the American Association of Community Colleges. The Jayhawk Wing of the Confederate Air Force named their beautifully restored PT-23 after Micky. "Miss Micky" is painted on the nose of the plane. The whole Axton family gathered to celebrate the unveiling of the"MISS MICKY". Micky had made t-shirts for everybody. 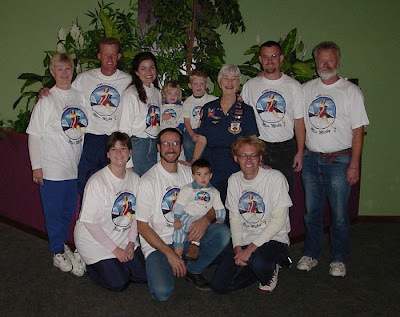 This pioneering WASP flew on silver wings into Glory on Feb. 6, 2010 in Eden Prairie, Minnesota, after a short illness. A memorial service will be held at Washburn-McReavy Funeral Chapal, 7625 Mitchell Rd., Eden Prairie, at 1:00 pm. on Wednesday, February 10th. A reception with the family will be held immediately following the service. MIcky's ashes will be buried beside her husband, in Wichita KS sometime in July 2010. Micky was preceded in death by her husband Wayne in 1998, her grandson Kevin Axton, of Lubbock, in 2002, and her brother Ralph "Tut" Tuttle of Enumclaw, WA. She is survived by daughter, Carol Moody of Eden Prairie, MN and her son, Gary (Sherry) Axton, of Lubbock. She is survived by grandchildren, Anette McCullough, Jannel McCullough, and David McCullough of Minnesota, Kipp (Melinda) Axton of San Antonio, Texas, and Cory (Jill) Axton, Christy (Daniel) Martin, and Leah Tyson, all of Lubbock. Her great-grandchildren are Aja McCullough of Minnesota, Lauren, Ryan, Marnee, and Zack of San Antonio and Jacob, Indy, Sydney, and Justin of Lubbock. She is also survived by many neices and nephews and cousins in Washington, Kansas, and California. On March 10, 2010, Micky Axton's family will be awarded the Congressional Gold Medal by Act of Congress. It is the highest award that Congress can give a civilian. From official obituary, Wings Across America's video interview and WASP Betty Turner's "Out of the Blue and Into History."